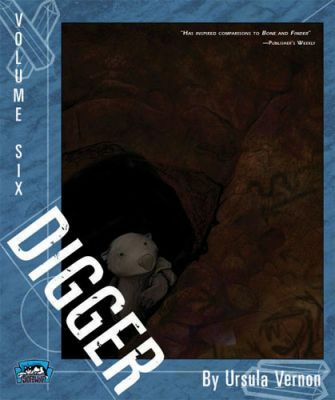 In this sixth and final volume of Digger, covering chapters eleven and twelve of Ursula Vernon's webcomic, our wombat heroine makes her way back from the Morrakgon Mountain monastery along with Grim Eyes and Murai. They make a beeline for the temple, but get intercepted by Surka with grave news. The Veiled have corralled the hyenas on their lands and are coming to surround the temple, leaving Murai the only one equipped to defend the temple (even with a broken arm). Meanwhile Digger and Ed (now dishomed by The Veiled as well as his former tribe) take a decidedly un-mystical crowbar to see about killing a God — or what is left of one, anyway. Who will come out of this with their liver intact? Will Boneclaw Mother do "The Thing" to Captain Jhalm? Will there be bug-on-a-stick?